Cook pasta according to directions, adding canellini beans for the last 2 minutes. Remove 1/2 cup of the cooking liquid and set aside. Drain pasta and beans and cover to keep warm. Finely shred peel from the lemon half (about 2 teaspoons). In a small frying pan, heat 1 Tablespoon of the Fused Whole Fruit Lemon Olive Oil over medium heat. Add lemon peel; cook and stir 1 minute or until lightly golden. In a food processor bowl, combine cooked lemon peel, basil, the remaining 2 Tablespoons of Fused Whole Fruit Lemon Olive Oil, the juice from the lemon half, 1/2 teaspoon salt, and 1/4 teaspoon pepper. Cover and process until smooth. Add reserved cooking liquid, 1 Tablespoon at a time, until desired consistency, processing mixture after every addition. 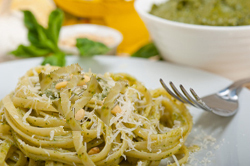 To serve, toss hot cooked pasta mixture with lemon-basil mixture.